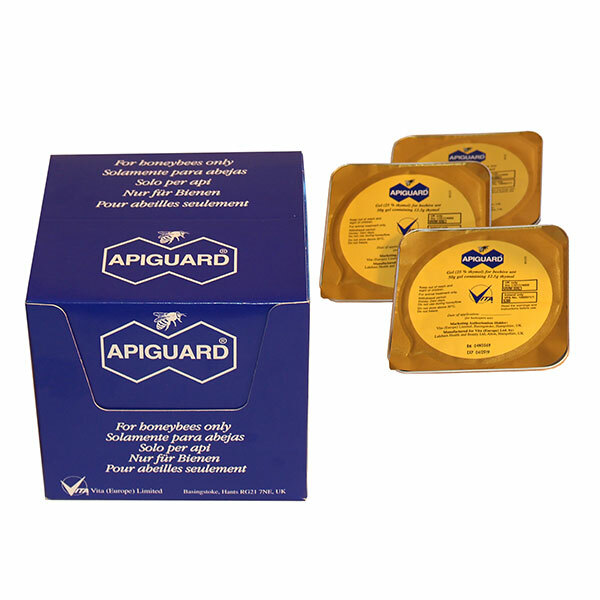 Apiguard is sold by the box, due to regulations, at a cost of €25 plus carriage but please contact us at 0402 24878 to place the order as we will have to issue a Medical Invoice with it. Apiguard is a sophisticated, patented slow release gel that ensures correct dosage of its active ingredient, thymol, which is a naturally occurring substance derived from the plant thyme. Two applications of 1 tray of 50g Apiguard gel per colony at a two week interval with a maximum of two treatments per year. Peel back the foil lid of the Apiguard tray leaving one corner of the lid attached to the tray. Place the open tray centrally on top of the brood frames, gel side up. Ensure that there is a free space of at least 0.5cm between the top of the tray and the hive cover board, for example, by placing an eke or an empty super on top of the brood box. After 2 week replace the 1st tray, if empty, with the 2nd tray and leave in the colony until both are empty or until you are installing the supers on the colonies in the spring. N.B. Please read the instructions on the box.